You can enjoy hours of fun with this award winning townhouse! You can play with the 4 roms, or you can rearange the house to your specifications withthe room dividers nd create your own space to play in. 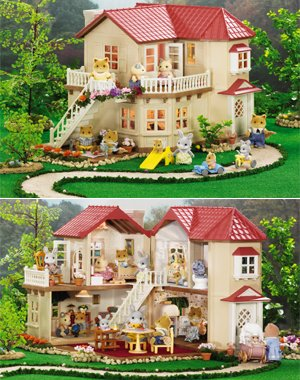 the home opens and closes, staircases move and you can even create an extra floor! At night you can even turn the lights on for more play fun! House measures 12"x12"x12". Batteries not included.